The situation sounds like something out of a dystopian novel. A toddler suffers from a mysterious disease. Doctors have no cure and want to let him die. The parents decide to take their child to another country that is willing to provide treatment. The doctors refuse to let the child leave, claiming it is kinder for him to die. This nightmare was no fictional story. It was the hell the parents of Alfie Evans lived through. Alfie Evans suffered from an undiagnosed neurogenerative disorder that left him on a ventilator. When British doctors wanted to pull the plug, the Evans wanted to take Alfie elsewhere in hopes of finding a cure. To the parents horror, they were not allowed to take their son elsewhere for treatment, even though they were willing to pay for the treatment. Instead, the Evans were told it would be kinder for Alfie to die. The uproar crossed the world. Thousands of people across national and racial lines were horrified at the idea of doctors essentially holding a child hostage from his parents. The Polish government demanded that Alfie be released from the hospital, and the Vatican offered to put Alfie in Rome’s Bambino Gesu Pediatric Hospital. 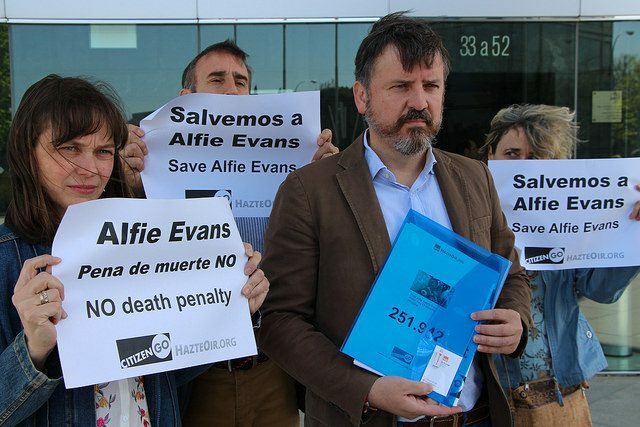 The Italian government even granted Alfie citizenship on April 23rd and threatened to hold British authorities responsible for the homicide of an Italian citizen if he was taken off the ventilator. The doctors of Britain, however, ignored the threats and disconnected the ventilator. The doctors were “gobsmacked”, however, when Alfie continued to breath. The fight for Alfie’s life ended in tragedy after a temporary stay of execution born of a miracle. The firestorm surrounding his life and death, however, have reignited debates over how much control the state should have when deciding who lives and who dies. The implications of Alfie’s death terrify many parents, and rightly so. After all, in this case, the government refused to allow a parent to save their child and insisted on killing them instead. More than one person has shivered and wondered, what comes next when parents are no longer allowed to protect their children?